Product prices and availability are accurate as of 2019-04-15 11:54:42 UTC and are subject to change. Any price and availability information displayed on http://www.amazon.com/ at the time of purchase will apply to the purchase of this product. 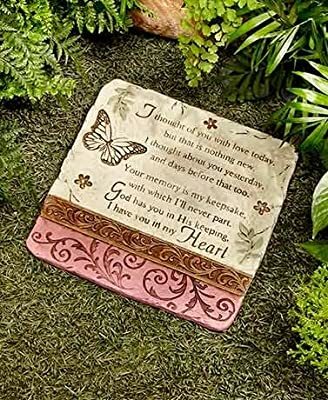 Create a garden memorial to a departed loved one with this I Thought Of You...Stone. It features a heartwarming sentiment with leaves, flowers, a butterfly and a scrollwork design. The stone can be set on the ground or has a keyhole hanger on the back to hang on a wall or fence. 10"W x 10-3/8"L. Cement. Ready to hang. "I thought of you with love today, but that is nothing new. I thought about you yesterday, and the days before that too. Your memory is my keepsake, with which I'll never part. God has you in His keeping, I have you in my heart."